Rehydrate & adds shine. Free of: sulfates, parabens, phthalates, gluten, drying alcohol and artificial colors. 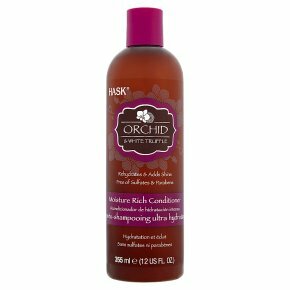 Not tested on animals.Dry hair doesn't stand a chance with Hask Orchid & White Truffle Moisture Rich Conditioner. This formula drenches dry, overworked hair with strengthening proteins. Luxurious European orchid helps hydrate and control frizz, while the decadent white truffle oil helps quench and transform excessively thirsty, distressed hair. Say good-bye to dry! Directions: Apply to wet hair. Leave on for 1-2 minutes. Rinse thoroughly. Ideal for daily use. For best results, use the Hask Orchid & White Truffle collection.